Gerbera plants are grown for the colourful flowers, in the past they were mainly grown as cut flowers, today things are different. Varieties are now available that are easier to grow in the garden, and they produce some of the most colourful flowers available. Some gerberas with almost a luminous quality, some with double flowers and multi coloured. They are still widely sold as cut flowers, and are also eye catching in the garden. The flowers look like big daisy flowers, and modern cultivars have larger flowers and some are double or semi double in form. As cut flowers they are long lasting and have long stems, great for vases. 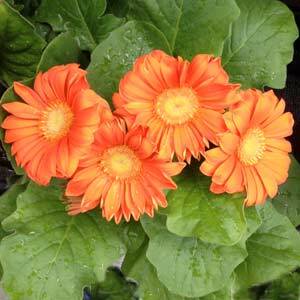 Grown from seed or from divided crowns gerberas like a very well drained soil and should be watered in the morning. This gives time for things to dry out and helps prevent mildew. The most important factors are good drainage and sun. A free draining soil will prevent crown rot which can be a problem with many varieties. Wilting or drooping is a sign of both overwatering and under watering. Full sun is often recommended and in cooler climates they do need this. In warmer areas some afternoon shade will be beneficial. Growing them in pots is a great alternative as it helps provide the drainage required. They will grow back after flowering in good conditions outdoors. Gerberas purchased as crowns or in pots need to planted so that the plant is not pushed down into the soil, as this can cause the crown to rot, a common problem. Crowns can be divided from late summer through to autumn. Seed can be sown in spring and plants placed in the garden as soon as the seedlings have developed. Seed is best planted from spring to summer. A sunny position is essential but protection from strong winds is required as well. Plants can be grown through ‘hoops’ in windy positions. 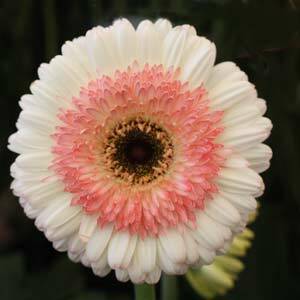 Gerberas purchased as crowns or in pots need to planted so that the plant is not pushed down into the soil, as this can cause the crown to rot, a common problem. Seed can be sown in spring and plants placed in the garden as soon as the seedlings have developed. Bothe plants and seeds are available for sale from online suppliers.